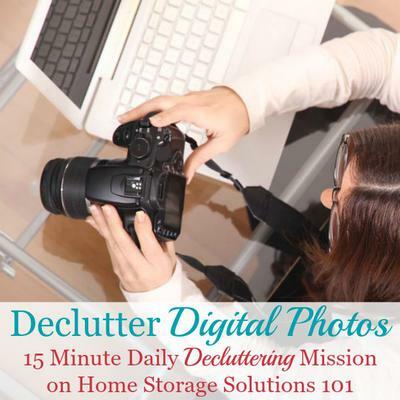 Today's mission is to declutter digital photos, so in this situation declutter means delete. This mission is designed to be done while we're working on the Organize Photos Challenge, which is part of the 52 Week Organized Home Challenge. Obviously I'm not asking you to do a mass purge and erase lots of precious memories. Instead, I'm wanting you to think about the fact that digital files can, in fact, be clutter. There was a time when we saw digitizing everything as "the answer" to almost every problem with paper clutter. Well, it certainly does help in certain instances, no doubt. BUT (sorry to shout, but I think this is important) now that we've got lots of digital files to manage we can see it brings its own set of problems and issues. Random accidental clicks, such as pictures of your thumb, the ceiling, etc. The benefits of this are significant. First, it can clear up memory space on your computer or in your backup. Second, and more important, it will now be so much easier for you to find and enjoy the really good pictures once you've gotten rid of the duds. Depending on how many digital photos you've got this mission can take more than fifteen minutes. That's OK. In all situations like this just work on it for 15 minutes at a time, and feel proud of what you accomplish. Working in small amounts, over time, really does get you results. You can even do this while listening to fun or relaxing music, or while watching television. It is important to do this task regularly from now on, as consistently as you take photos. It is cheap and easy to take lots of photos these days, so we do. But you need to get in the habit of culling down your photos as quickly as you take them so you keep the best and delete the rest! Below I'm going to remind you of a couple more places to make sure you declutter, beside your computer, when doing this mission. When I discussed this mission above I specifically was discussing your digital photos on your computer, but the mission also applies to other devices where you've got digital photos. So make sure to transfer all of your photos to your computer from such devices, including your smart phone and/or digital camera, and then delete from these devices as well. It may be even easier to delete from these devices because once you've transferred the photos to the computer (and assuming your computer is regularly backed up!) you don't need to keep duplicate photos on these other devices. So it may be as simple as doing a mass delete. Or you can do the same process you did on your computer and keep just a few special photos if you wish on these devices, although I would encourage you to keep far fewer on them than in your master computer photo files. I just know some people (including me) like to have a few extra special photos to show off to friends from your phone, for example. The benefits of this are HUGE, especially when it comes to your smart phone. If you often run into trouble with your phone saying it cannot perform a function because it doesn't have enough memory, cull photos! That almost always helps! Don't forget to delete photos from several albums, including your camera roll, Instagram folder, videos, and more. Tell me in the comments how this mission is going for you. I'd love to hear! 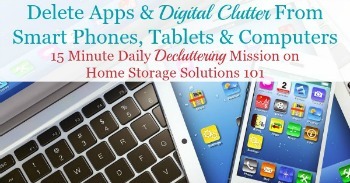 I hope this mission has gotten you excited to get rid of some of your digital clutter. 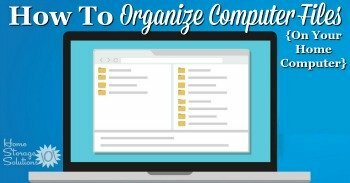 Here is how to organize computer files on your home computer. 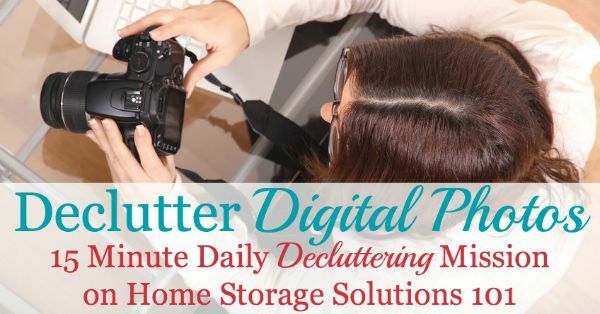 In addition, here's more ideas for digital clutter you can get rid of from your smart phone, tablet and computer. 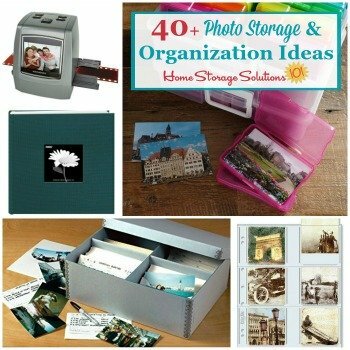 I organize all of my digital photos by year, then month, then day (if I know the date - some of my old photos that I've digitized don't have exact dates). I also will label the folder with the event, if applicable. So in folder 2015, then folder July, there is a folder for 03 - Trip to Pittsburgh. Then I name the pictures by who is in it or what it is of. I also number them, so they are in order of when they were taken. So... 01 - Name and Name.jpg would be a picture. Makes it a lot easier if I need to search a folder. It is also time consuming though! I use Dropbox on my phone and it automatically uploads any pictures I take to the Dropbox site. It makes it easier to transfer pictures to my computer where I can store them. Once the pictures are on my computer, I can delete them from my phone if I want. I also have an external hard drive that I use to backup all of my digital photos. It works! Now to find more 15 minute segments of time! Do you have any suggestions on programs that organize digital photos into date? As a backup store your best photos on a thumb drive and put it in your safe or other secure area. I was one of those who couldn't update my computer because of the memory issue and photos were the cause and videos, ugh! 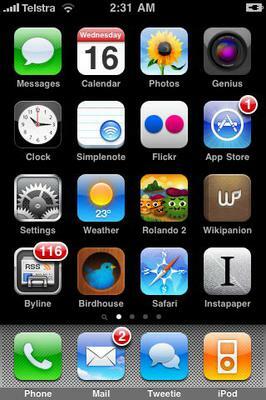 I couldn't download my phone to the computer, so my phone began to hate me as well! It has taken me a lot of time cleaning up the pictures on my computer, but I'm making progress! Thank you for motivating us, it is really changing my habits and I am less stressed with clutter! Apple iPhone update to photo option 4x6, please?! Idk why but the iPhone photo editor does not include a 4x6 option. Whether I’m printing pictures at home or at a store (eg. Walgreens), 4x6 is the most common (and least expensive) option. With each iPhone update, I think it will be included, but it’s not. In fact if I remember correctly, it used to be an option back in the day. Is there anyone who can help get this suggestion to the proper group at Apple? Is there a way to delete photo’s from IPhone but keep on IPad, when they are linked together? To sort photos by month or year on Apple's Photos program on a Mac, you can create a smart album for each month or year. The photos will then automatically be selected. I do this for each year all at one time, creating 12 smart albums. I also create albums for special events or topics like trips, graduations, weddings, etc. I am not aware of a way to make smart albums on an iPhone or iPad using the Photos app. For the person who wants to crop photos to 4 x 6, just use the 2 x 3 crop. It’s the same thing.